Cold weather is coming! Winter clothes and accessories need to be ready and within reach. Do you have a handful of tights, leggings, long socks, or thermal underwear you depend on for warmth and comfort this time of year? It’s easy for them to get lost and tangled, especially deep inside drawers. Here are simple steps to keep them together, organized, and accessible. Gather and roll them up! Use a thick rubber band to keep in place (thin ones get brittle and break too easily.) Extra hair ties and the thick rubber bands that hold fresh broccoli stalks together at the grocery store work great. 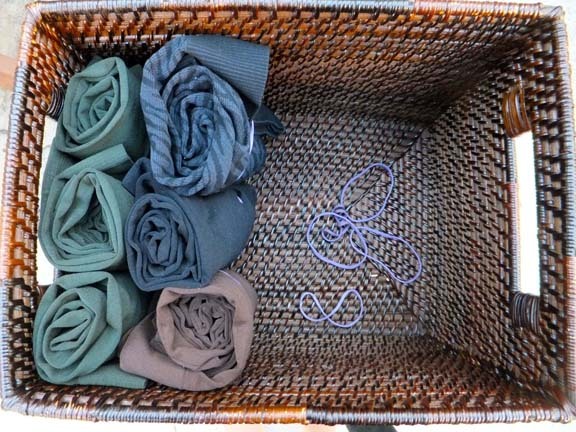 Place the rolled and banded tights, leggings, or long socks upright in a drawer, basket or bin. I call this the “Cinnamon Roll.” In this view you see exactly what you have, how many, then pick and choose as you please without having to dig through a tangled and mis-matched mess. Rubber bands hold things together, so in the midst of the morning rush when changing your mind as to what color to wear, simply toss back what you don’t want without fear of unraveling…then grab another. 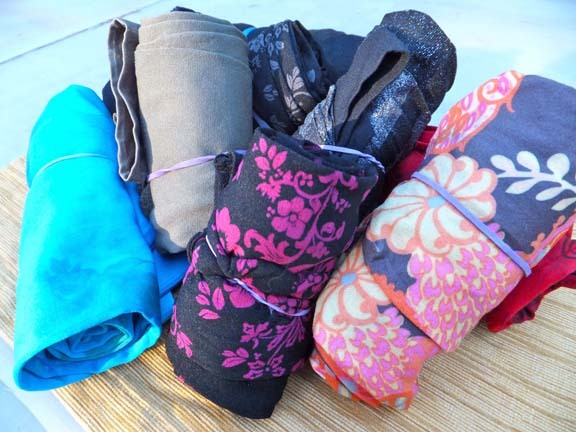 As you grab to wear, toss the rubber bands back in to use again when laundry is done. Read more cold weather closet organizing tips. Ready for more? 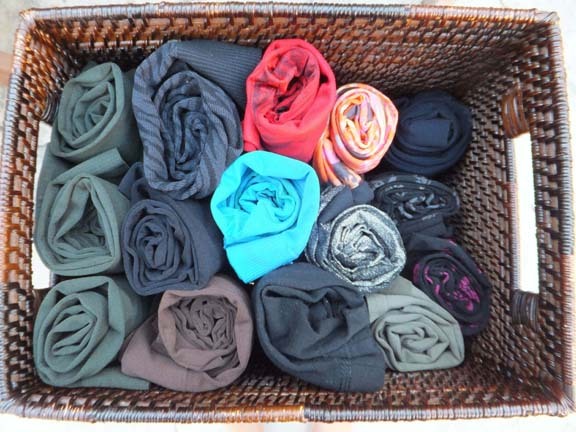 Call (510) 229-7321 today to schedule a complimentary estimate for your wardrobe and accessory organizing goals. Gift certificates are available.